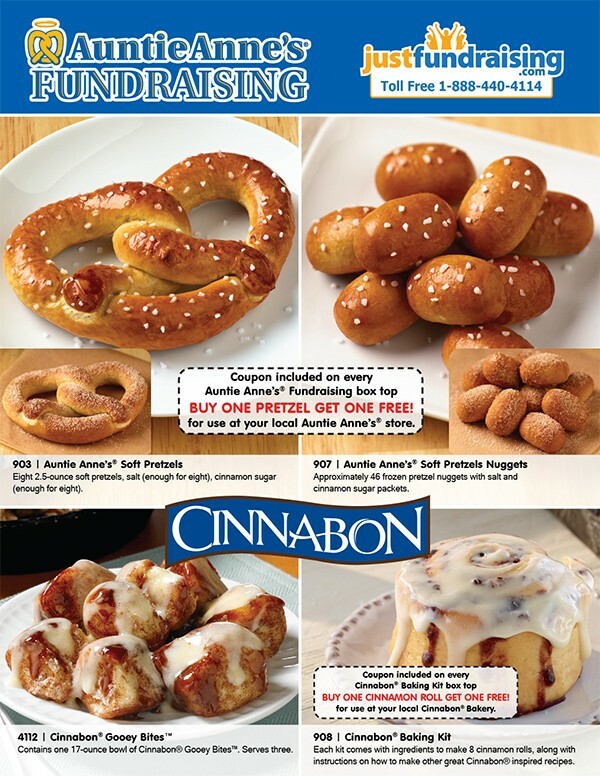 Auntie Anne's Pretzel fundraiser is such as easy sell, you'll reach your fundraising goal in no time. Who can resist buying a salty or cinnamon sugar flavored pretzel? It also includes 2 delicious Cinnabon favorites! The Auntie Anne’s Pretzel fundraiser is so successful because everyone loves pretzels, especially when it’s Auntie Anne’s quality. It features soft pretzels, soft pretzel nuggets both with salt and cinnamon sugar packets. It also features Cinnabon gooey bites and a Cinnabon baking kit. It's perfect for groups that have 25 or more sellers. Free shipping for the Auntie Anne’s program starts at 400 items, so it’s important to have a motivated group, that you feel can help you reach that target and beyond. Reach Your Fundraising Goal: Your group makes 40% profit on all sales! That’s an average of $7.40 profit per box of preformed cookies! Aim for 400 units, in order to get free shipping. If you sell 200 items - you make $1,480 minus your $200 shipping charge for a profit of $1,280 – not bad! Sell 400 items, and you’ll profit $2,960. Quality & Convenience: Auntie Anne’s and Cinnabon are two well known snack brands so you know your supporters are buying a quality product. The products are sold with packets of toppings for a fun and delicious baking experience. Auntie Anne’s Order-Taker – What Exactly Are Your Supporters Buying? Auntie Anne’s soft pretzel kit comes with eight 2.5 oz pretzels per box along with salt and cinnamon sugar toppings. Auntie Anne’s Soft Pretzel Nuggets come with approximately 46 frozen pretzel nuggets with salt and cinnamon sugar packets. Cinnabon Gooey bites contains 17-ounce bowl of bites to serve 3 people. Priced To Sell: Only $18 - $20 for a quality pretzel product and helping out a great cause. FREE to Start: The Otis Spunkmeyer fundraising program costs absolutely nothing to get started. Simply let us know how many fundraising participants you have and we’ll send 1 order-taker for each of them, at no charge. Minimum Order: The minimum order is 150 items. A small group of 25, selling only 5 units each will easily reach their goal! Pack-to-the-Case Program: Each products have to be rounded up to a multiple of 6 when you place your final order.Gooey Bites are packed in cases of 12. Simply sell these extras for even more profit. . Your Group Keeps Up To 40% Profit! How Does the Auntie Anne's Fundraiser Works? 1. 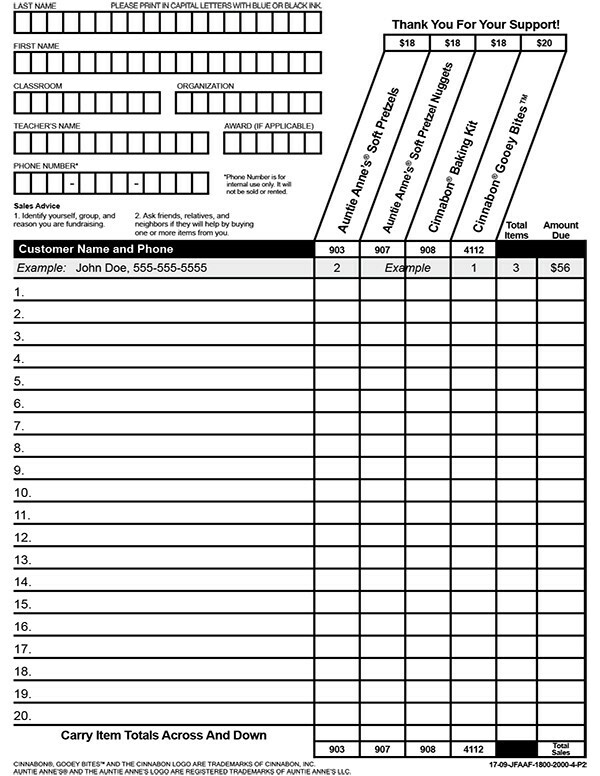 Order 1 Auntie Anne's Pretzel order-taker PER fundraising participant – they're FREE of charge! 2. Have your group members show the order-taker to friends, family, neighbors, and or co-workers and invite them to purchase 1 or more Auntie Anne's or Cinnabon products. (Note: Your participants will collect the funds up-front, and will take note of their supporter's name and mailing address on the order form included). Please ensure that no minor goes fundraising door-to-door alone. If they choose to go door-to-door, they need to be in two's or three's, and or with a parent. Example 1: if you order 5 items of a given flavor, we will round it up to 6 items. More Profit: It's a great way to make extra profit and after all this is your fundraiser! Simply sell them to your supporters- many will want a 2nd or 3rd item, especially once they've tried it! There will be others that can still be approached. If you want, you can sell them quickly by offering them at a fire-sale price i.e. only $15 each! I was a little apprehensive at first but we ended up raising much more than I thought. Our 17 girls sold 242 units and make a nice profit of $1,681. The 2 for 1 pretzel coupon you provide with every Auntie Anne's product really helped to get more sales. We'll probably do this one again in the Spring.